This post was originally posted on Coteries Lab, a digital agency based in Lausanne and Corgémont. So you have amazing business ideas and projects? No matter where you work, being in a young startup, an association or in a big corporation, innovating is great! But how to start? 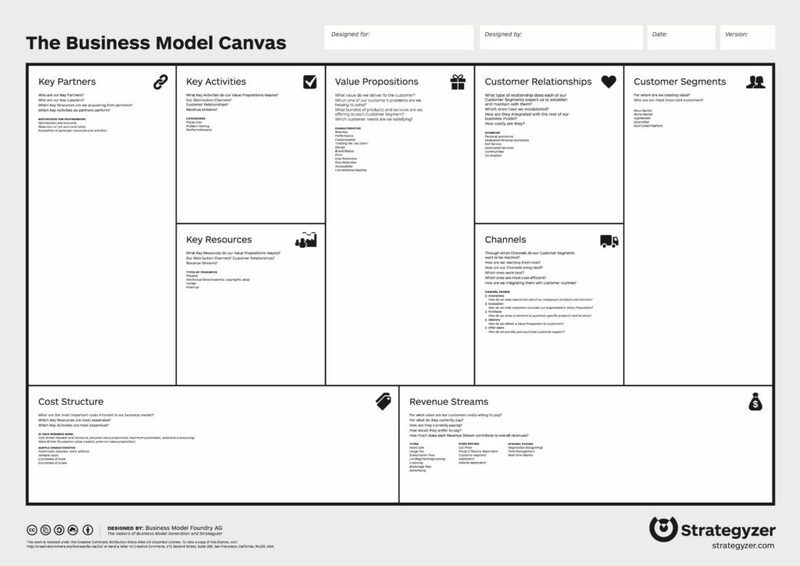 You may have heard (or being taught) to start designing a Business Model Canvas, created by Alexander Osterwalder and Yves Pigneur in 2010. But the key is to start only with the heart of this model, the Value Proposition, and using the Value Proposition Canvas (from the same authors). Once, and only once, you’ve defined it, validated or unvalidated your assumptions, you should start filling the Business Model Canvas. This tool allows you to map and structure your whole project on one page. Now, let’s dive into the Business Model Canvas and how to build it! First, ask yourself for who you are developing this idea and desiring to create value? It sounds deadly stupid and common sense, but without customers, a business cannot survive. However, that’s where many projects fail: not putting the customer in the center. Start by identifying which groups of people or organizations you want to reach and serve. Be conscious about who you want to serve, and who you want to ignore. Most probably, you will be building different customers segments. Why should they choose you over your competitors? What do you offer them to satisfy their needs better than the others? The Value Proposition is essential and in the heart of your business: which one of your customer’s problems are you trying to solve and what are the benefits you offer them? Your value proposition can be made of qualitative or quantitative elements. They may be benefits for all your customer segments and some specific ones. Do you want to create a community among your customers or do you want to offer them personal 1-1 assistance? It’s time to ask yourself what kind of customer relationships you want to build to acquire new ones, to retain them or to boost your sales. Without customers, a business cannot survive. But even more, without revenues, it will be impossible to survive (and we hope we are not teaching you something new here ;-)!). Just to be clear, generating revenues does not mean to be “for profit”. Someone (sponsor, donation, customers, etc.) has to pay to have the product or service alive. This block describes how you are going to earn money. Is your revenue model based on unique simple transactions, on subscriptions model (recurring revenue) or any other model? What do you need to offer and deliver all the activities and elements you’ve filled in the previous sections? The key resources are the most important assets required to make your business model work. You can need several resources depending on your business model and it can be physical (machines? ), intellectual (patents? ), human or financial assets (need of capital to invest if you’re a trader, for instance). Example: Nespresso’s key activities are the production of coffee pods, marketing, and B2C distribution. And finally, because it would be too good to be true not to have any: what are your most important costs incurred to make your business work? Identify the fix and variable costs. Which activities or resources are the most expensive and could you try to minimise them? Depending on your strategy, you can either have a cost-driven structure (meaning that you will optimise to get the most out of a limited budget) or a value-driven structure. 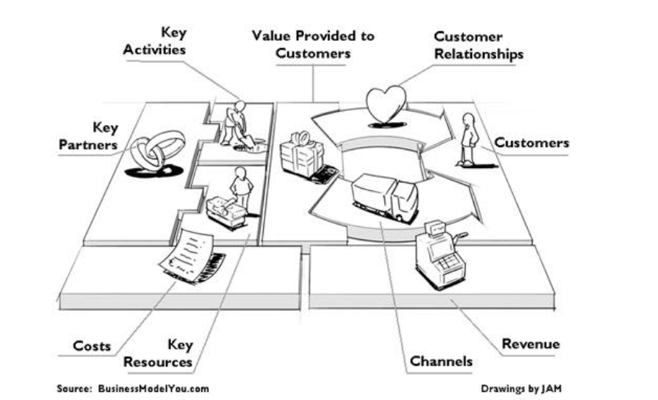 Once you’ve filled the Business Model Canvas, you should have a clear overview of your product/service and business and of your customers. The journey is of course not over… you need to launch your project. And remember that a business model is not set in stone and that you may have to refine it, adapt or even completely rework it (instead of persevering in the wrong direction). We, at Coteries, can help you all along the process, for instance, to coach you during the realisation of your Business Model Canvas. Or to design, develop and market your digital product/service (web or mobile application, chatbot, etc.). So do not hesitate to contact us!